Thanks so much for visiting Live Renewed and your interest in my homemade disinfecting wipes! Updated November 2012: I recently posted an updated version of my Homemade “Clorox” Disinfecting Wipes with two new recipes for you to choose from as a part of my series 31 Days to Green Clean. Please click over to read the updated post, with updated information and recipes! Having 2 small children, especially an active, independent, and potty-training toddler, means lots of little messes. Sometimes I just don’t want to get out the cleaning spray and a use a big rag just to clean up a small mess. 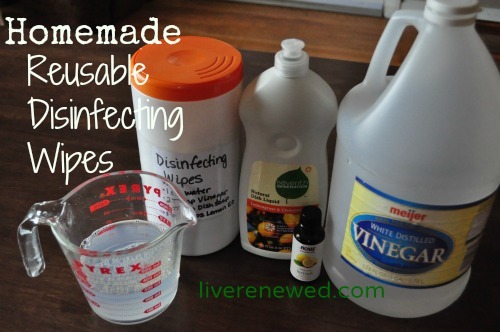 Please read the updated Homemade Disinfecting Wipes post to find the new recipes! 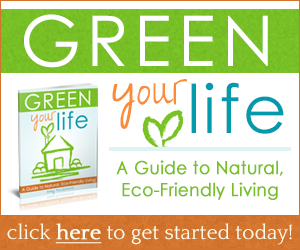 Want to Read More About Homemade and Green Cleaning? Subscribe to e-mail updates, or in a reader, to be sure you don’t miss a single post. You can also connect with me on Twitter and Facebook! Find castile soap and tea tree oil on Amazon! 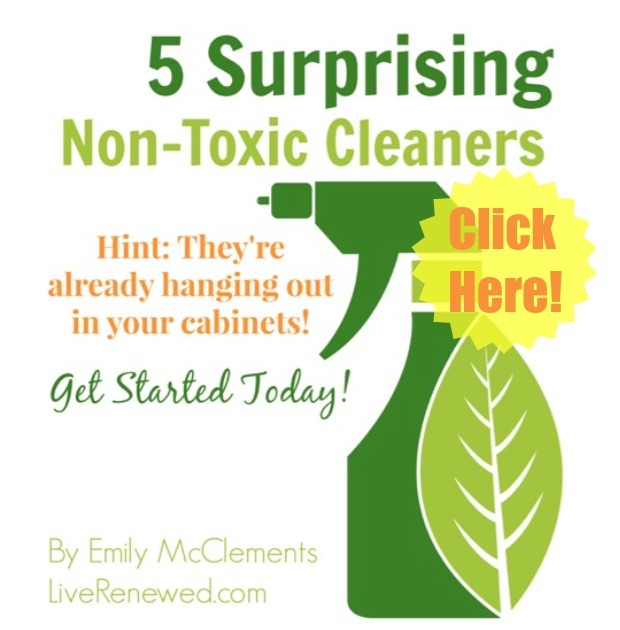 This post is a part of the Natural Housecleaning Carnival at Passionate Homemaking. Check it out for more great natural cleaning ideas and tips! This is a really good idea. I’m always tempted to buy the wipes, because I like how clean they get things (my granite countertops sparkle so much more with them) but the hazardous to humans and domestic animals thing gets to me too. I have all of these ingredients on hand, so I may try to do this soon. 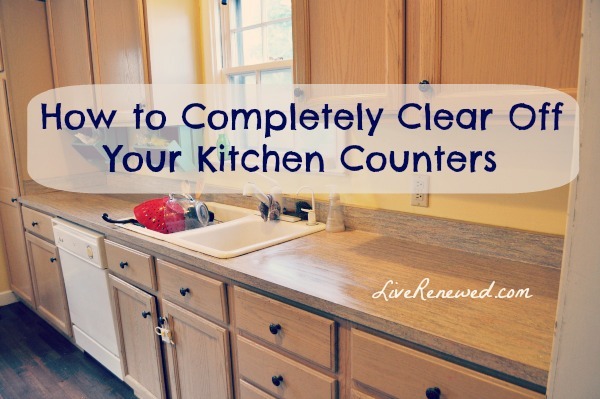 I’m just not sure about the vinegar on granite countertops – wouldn’t it be slightly corrosive? Thanks Jenni! Yes, you should not use vinegar on granite, or other porous surfaces like marble, because it could be corrosive. You could just make the wipes with castile soap and tea tree oil. One of my favorite homemade cleaners is water mixed with a few squirts of castile soap and a few drops of tea tree oil in a spray bottle. It would still have cleani disinfecting properties because of the tea tree oil. Let me know how that works for you! So if you cut up a t-shirt it won’t tatter at all? I tried to make my own rags out of an old baby blanket and they fell to pieces. If you use a jersey material shirt, it won’t fray/tatter. Love this! This too has been the product that I have “missed” the most for the ease of it as we are a household with little ones and one potty trainer too. I will definitely be making these. I kept meaning to make something and just never got to it. Thanks!! I’m curious about the husbands opposed to the smell of vinegar, but not the tea tree oil. Vinegar does stink, but it goes away. My only experience with tea tree oil is one small bottle that was really stinky and the smell lingered for a really long time. Did I just get a bad bottle or does the smell go away when you mix it with other things? Also, about t-shirts, I’ve had lots of luck with Fruit of the Loom, Hanes and Just My Size. They don’t fray at all, but they do curl up on the edges. I haven’t noticed this to be a problem for us though. I thought tea tree oil was toxic to animals, especially seeing as they lie on the floor and then lick their fur, or will go for tiny specks of dropped food. I was resarching Tea Tree Oil, and it seems to have antibacterial, antiviral properties, however says it’s toxic. I would be careful handling and storing them especially around little kids. LOVE this!! I have been slowly moving toward making all of my cleaning products at home and eliminating paper towels. I can’t wait to check out your other natural cleaning posts! Tea Tree Oil can be toxic when it is ingested at full strength. Compared to mainstream chemical cleaners with other toxic ingredients, the tea tree oil solution is so diluted and we don’t use it on things that we will be eating or drinking off of, or that our dog would come into contact with, therefore I’m not too concerned about it. But thanks for pointing out that it can be toxic in some instances and that care should be taken when handling and storing tea tree oil, just like with any type of cleaner! I am wondering about the soap. Do you have to use that brand? Is there a place to find the oil that is not whole foods or trader joes (both are at least 45 minuted from me). Thanks! I love the idea, and I too have been thiking about trying to eliminate paper waste here. Any suggestions on cleaning cloth napkins? Tea tree oil can be found at Walmart stores, at over the counter pharmacy. Hi Chris, you do not have to use Dr. Bronner’s castile soap, you can use any type of liquid castile soap. But, I think Dr. Bronner’s is pretty widely available. I know you can get it at Target around here, and our midwest grocery store Meijer, also carries it, so I’m sure that you could find it at a store near you. Tea Tree Oil is also available at Target, near the vitamins. As far as cleaning cloth napkins, I was a load or two of cleaning cloths per week because we only use cloth around our house. Here’s a post I wrote about the basics of switching from paper to cloth around the house. Thanks for stopping by Live Renewed! Laundry saving tip: Put this disinfectant cleaner in a canning jar and add a few rags. When you use these as a quick wipe up, you could just rinse out the rag under the faucet and then put it back in the jar. I have also purchased castile soap at Walgreens, the price actually isn’t much higher than I’ve seen it elsewhere. I found tea tree oil at Walmart in the pharmacy section. Neat idea! I think I would write something on the container so little fanny’s don’t accidently get wiped with the wrong thing. Castile soap is a type of soap made from pure oils. One of the most popular brands is Dr. Bronner’s. You can find both castile soap and tea tree oil at Target! Thanks for stopping by Live Renewed! Found you through Money Saving Mom! Tea Tree oil has so many uses. It’s great for cleaning, bee stings, warts, nail fungus, and has amazing healing properties! Before the new house and 2 more kids I used exclusively Melaleuca products. The pure tea tree oil I used from that company had a mild numbing effect. It was great for toothaches, and I even had my dentist apply it during dental visits. 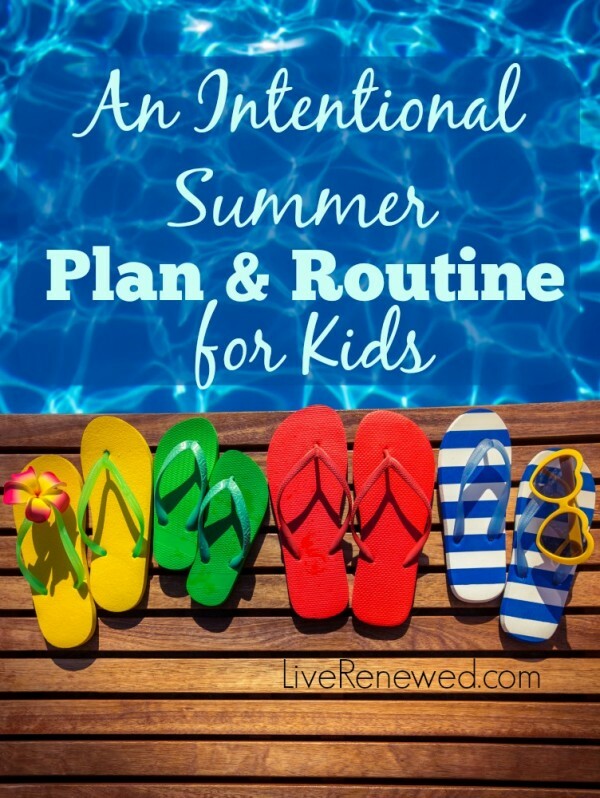 Checking your blog out from Money Saving Mom! Boy am I glad she has introduced us! LOL! I love natural homemade cleaners. They are the best. While I have made my own clorax wipes in the past, I used paper towels. We have gone without paper towels for a week now. We are managing fine and I hope that I can do without them for several more weeks. I am also trying to eliminate extra paper around here. I love your receipe for the wipes. I will be getting a t shirt and cutting it up right away. We have plenty I can use. Hi Lowbudget! Thanks for your kind words. 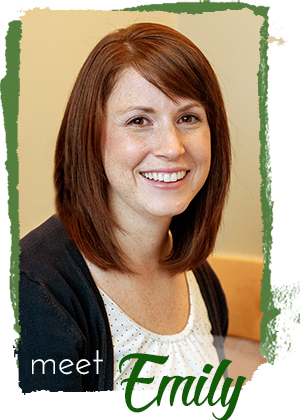 It is good to “meet” you too! Good for you for going a week without paper towels. I stopped buying them a year and a half ago – and never looked back! You can do it. I love this idea, and my hubby also really hates the smell of vinegar. I was wondering how well you think it might work without the tea tree oil?? I’m allergic to anything in the evergreen family, and tea tree oil gives me instant migraines. I think they would work fine without the tea tree oil, but the smell of vinegar may be stronger, unless you use a scented castile soap. Vinegar also has disinfecting properties, I just added the castile soap and tea tree oil for a little extra cleaning and disinfecting punch. You can also use Lemon or orange oils. Citrus as awesome cleaning properties. Yes, I love citrus essential oils for cleaning! But, I would still use the tea tree oil because it provides the disinfecting and anti-bacterial qualities! THANK YOU!!! 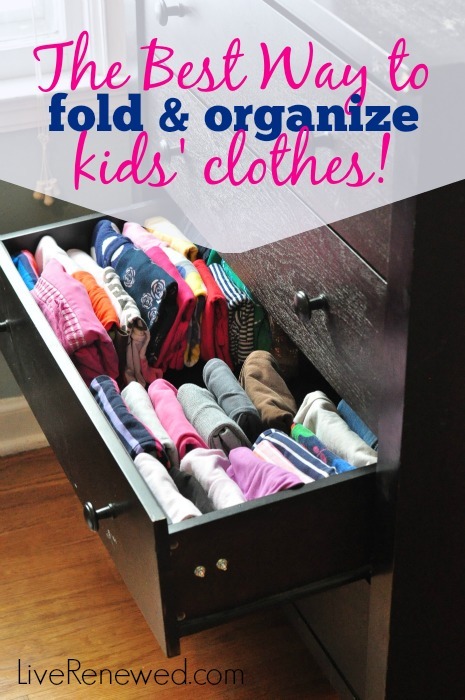 What a great idea to cut up old shirts and use a wipe box! And I was just thinking about how to quickly clean up bathroom messes (two boys here!) and was tempted to get cleaning wipes. I also want to avoid the chemicals. My husband also hates the smell of vinegar (I like it. I think of it as clean!). I linked from Money Saving Mom. Now I will have to check out your site! Thanks! I made these the other day and I love them. I think when I get an empty spray bottle I will make some up as a spray cleaner for the tub and such. Thanks. I just found your blog and was reading through your posts. My husband also HATES the smell of vinegar and I have been somewhat reluctant to use vinegar in my cleaning (and especially my hair). I have made several other green changes in our household, but didn’t know what to do about vinegar. Thank you so much! Hi Rachel! Welcome to Live Renewed! I usually use vinegar for cleaning when my hubs isn’t around. When he is around, or if he’s the one doing the cleaning, we use our favorite homemade multipurpose cleaner which consists of a few squirts of castile soap and a several drops of tea tree oil in a spray bottle and then fill it up the rest of the way with water. Works great for cleaning all around the house! 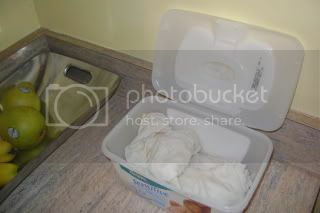 Also, you could make the wipes without vinegar, I just added it for extra disinfecting qualities. You could also try adding another essential oil, which might help to cover up the smell. Hope that helps! I just mixed up a new “batch” of these and am reminded how much I like this! I use these wipes all the time. We live in China and when you see the streets and all you are walking in outside there is no way you want shoes in your house… so we have a bunch of sandals that we have people wear – but some how even those get FILTHY – so every time I mop my floors I sit down with my handy homemade “clorox” wipes and wipe down all the sandals before putting them back in the box by the door. There is no way I could afford to buy real clorox wipes (esp. here!) 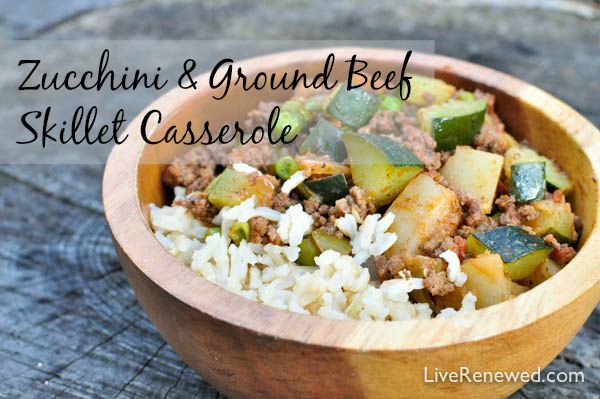 and these are just so quick and easy to have on hand! Thanks so much for sharing this. I added a couple drops of Peppermint Ess. oil to it this time simply to help it smell even better. I’m so glad they work so well for you Jeaniene! I love the idea of adding the peppermint essential oil – I’ll have to try that next time! I tried to make these a few times and they keep getting moldy on me. I love the idea of it and really want them to work, but I can’t get them to stop molding. I even tried to just make the solution, but mold collects on the top of it…any ideas? Bethanne – Are you using tea tree oil? Yes, I was…I have since stopped and that seemed to stop the mold…not sure why though. Thank you SO much for this! I didn’t know about the warning. Scary with a baby in the house. I just ran out of lysol wipes this morning, so I made the wipes last night from an old shirt of my husband’s and I, of course, have a baby wipe container. I’ve also been looking for ways to save money due to us about to lose over half our income next month, and this will save a ton! So I made them today, I have 42 wipes. I used 4 1/3 cups water, 2 1/3 cups vinegar, a little tea tree oil that I got a dropper from a left over one from the baby gas drops, and a tiny bit of hand soap (since I don’t have the stuff you were talking about). It worked SO great, and I think it even cleaned better than the clorox/lysol wipes do, and it smells so good. I will definitely be doing this more often. I hung a plastic bag (free!) on the wall in the kitchen and I just placed them in that when I was done with them. Also, I tried the disposable wipe method using half a papertowel roll, I got good ones too, and yea, they just fell apart, so that was out. So I’m very glad I found this. If you have a swiffer wetjet, you can take the bottle with the solution once you use it up, boil water, put the bottle cap down in the water (you only have to cover the cap) for 90 seconds, then twist the top off (might need to use some muscle), then there’s little teeth things that prevent you from removing the top, just cut those down and you’ll now be able to remove the top forever. You can also make your own cleaning pads for it. I just use the ones I got from my steam cleaner (that crapped out after a year). For those who are concerned about using tea tree oil or who don’t like the smell, you can use lavendar essential oil instead. It has antibacterial properties. Also, for those who are having problems with mold, try using distilled water instead of tap water. Tap water, even filtered, contains bacteria. Those that have granite can leave the vinegar out – the lavendar/tea tree essential oils have enough antibacterial properties that this solution would still kill germs without the vinegar. I went shopping for some essential oils yesterday. I love the smell of almonds and was looking for that essential oil. I had no luck at all. Any ideas of who might? Also someone had suggested pure almond extract? Could that work? I did find some almond scented Castile soap but would love a stronger smell. 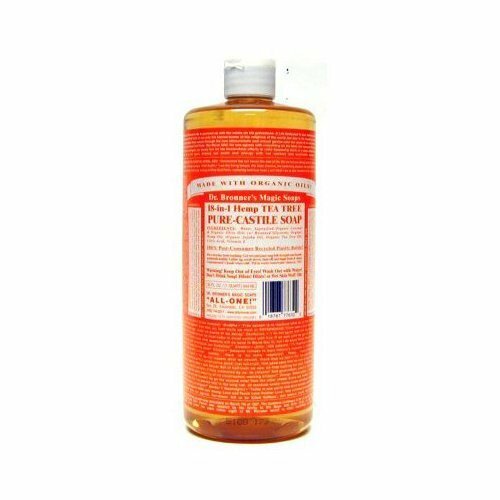 Would Dr. Bronner’s Tea Tree Soap work? Yep! Any castille soap should work just fine – but you should still add the tea tree oil for it’s anti-baterial qualities! I’m not sure that just the oil in the soap would be enough. So I saw this on Pinterest and thought I would give it a try! I SEARCHED for castile soap at Wal*Mart and Target and couldn’t find it, but finally found it at my local Natural Foods store…my question is this, I didn’t read carefully enough first (duh!) and bought the bar soap. Can I shave it and still mix this up? Or will I need to head back to the store?! If you have a Trader Joe’s near by: they have the best price on Dr. Bronner’s soap (only the peppermint bar and large bottle) and also sell Desert Essence tea Tree Oil. I would love to make this but I was also wondering if anyone had some natural/green ideas that will act like bleach? We have Well water and when our softener salt ran out EVERYTHING turns red and is stained. Any suggestions for getting the red out?? The only thing I’ve had moderate success with is by soaking with bleach for several hours to days (which obviously is super tricky on shower walls) but I would rather not use that. Thanks!!! Peroxide maybe? Or a natural CLR type product? I have one by Nature Clean. Is the red from iron? What temp do you wash your cleaning rags on? Cold or hot? Castile Soap and vinegar cancel each other out because one is a base and one is a acid, so you aren’t getting any benefits with them together at all. Do one or the other not both together. I know not to mix the 2….do you all think the recipe will work if I omit the vinegar. I read that castile soap has great stuff in it for cleaning/disinfecting. The vinegar just seems extra at that point (and you aren’t supposed to mix them anyway). Any thoughts? Is there any recipe that does NOT involve castile soap? I hate that stuff–it leaves a film on everything. I’ve tried it for dishes, hand soap, cleaners, etc. I can always tell where it has been used. I don’t understand how people can rave about these recipes with that stuff in them! I do know people who use them b/c they are more concerned about the hazards, but they admit that it leaves a film. Help!